For cabling and communications manufacturers, knowing the difference between different category cables (CAT5e, CAT6, CAT6A and CAT7) is easy. For those that are looking to use category cable to wire a home, office, data center or business, the performance ratings and variances between the cables can be confusing. To help our customers better understand the differences, we will review the capabilities of each category to help choose the right category cable for your installations. For each of the category cables we are referencing, the standards related to a maximum installation length of 100 meters (roughly 328 feet). CAT5e category cable supports speeds up to Gigabit (1,000 Megabits per second) Ethernet at 100 MHz. An enhancement of the previously released CAT5 cable, CAT5E (the E designates Enhanced) cable is similar in specifications to CAT5 cable, but has been enhanced to minimize crosstalk. In addition, CAT5e category cable is best suited for installations in networks that change frequently, such as servers with patch panels, home and business installations where you are plugging patch cord connections from computers into wall ports and other similar uses. CAT5e is available in different configurations, including solid copper wire vs. stranded wire, as well as in shielded vs. unshielded variations. Shielded CAT5e is often used in situations where there may be a great deal of electromagnetic interference (EMI) from other devices in a home or office situation. Similar to CAT5e, CAT6 and CAT6a supports speeds over a Gigabit (1,000 Megabits per second) Ethernet, but the main difference from CAT5e is that CAT6 and CAT6a runs at a bandwidth of 250 MHz, which makes CAT6 and CAT6a ideal for business use. For homes and businesses that are looking to offer high performance connections, upgrading to CAT6 or CAT6a can help minimize issues with crosstalk and EMI on networks. For those looking to offer a sense of “future-proofing” their home or business, CAT6 and CAT6a offer advantages over CAT5e. The higher bandwidth of these category cables can keep your networking setup at high performance levels as service providers offer continually higher speeds. In addition, CAT6 is suited for more permanent installations in home or offices, due to the ability of CAT6 to carry higher bandwidths versus CAT5e. CAT6 and CAT6a are also available in solid copper wire vs. stranded wire, which offers different advantages. Solid cable consists of a single piece of copper for electrical conduction, while stranded cable use numerous copper wires stranded or twisted together for conductors. Stranded wire is best used for applications where flexibility is important, including desks and other areas of frequent movement, while solid cable is a better option for permanent installations, including walls and outdoor, where the durability of solid cable offers longevity versus flexibility. The next iteration of category cable, CAT7, offers even higher levels of speed for users, with support up to 10 Gigabit (10,000 Megabits per second) Ethernet, with a bandwidth of 500 MHz. CAT7 cables offer exceptional data speed. CAT7 is designed to bring the highest possible speeds for business and server applications, while adding better resistance to EMI, high power ratings and less loss of voltage. For home use, CAT7 can also be beneficial for smart home installations related to whole home technology solutions. 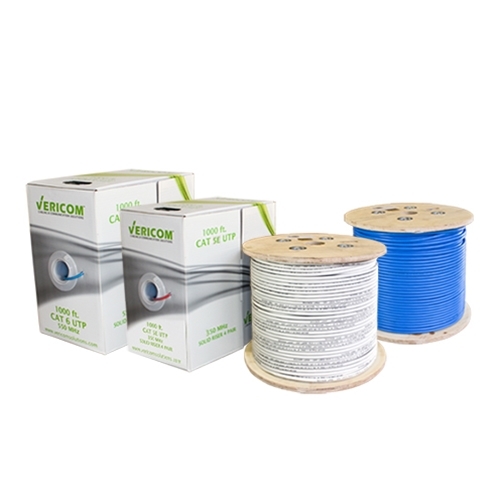 Whether you are working on a home, business or data center installation of category cables, Vericom Global Solutions offers the solutions designed for your particular needs. In addition, we offer a wide variety of installation accessories and supplies, racks and cabinets, splitters, wall plates and more for your particular cabling and communications installations.